The California Air Resources Board (ARB) recently released its draft Cap-and-Trade Auction Proceeds Second Investment Plan [pdf], which lays out the how the state will focus its investments to reduce greenhouse gas emissions over the next three years. The investment plan is intended to inform California state budget-makers in their annual decisions on how to focus climate investments. This is the second ARB investment plan since the start of the California cap-and-trade program. Fortunately, there is a lot to be encouraged by in this draft document. As we discuss below, ARB has put significant emphasis on farmland conservation strategies and other ‘climate-smart’ agricultural activities. There are opportunities to weigh in on the draft plan: Either attend one of the upcoming workshops (details below) or send in a letter. The discussion of the draft plan presents an important opportunity to highlight how sustainable agricultural solutions offer some of the best opportunities for reducing greenhouse gas emissions while supporting a resilient food and farm system. Last month, CalCAN and our partners reviewed an early Concept Paper [pdf] for the Investment Plan. As we noted in our comments [click to view] to ARB, that document gets a lot of things right, and the draft Investment Plan released yesterday moves in an overall positive direction as well. Agricultural solutions are highlighted across all three ‘Investment Concept Areas’ –Transportation & Sustainable Communities, Clean Energy & Energy Efficiency, and Natural Resources & Waste Diversion – demonstrating the diversity of opportunities available in the sector. For the first time, farmland conservation is placed front-and-center. Agricultural land conservation strategies, including easements, are a keystone of the proposed efforts to achieve emissions reductions on the state’s natural and working lands. This document also shows how far we have come in the conversation around soil carbon sequestration opportunities, in just a few short years. There is repeated mention of the need to store carbon in our natural and working landscapes, and recognition of the multiple benefits that ‘healthy soils’ can provide. More widespread production and application of compost is promoted as a key strategy. 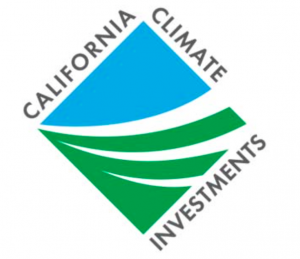 Click to view CalCAN’s comments on the climate change investment plan. However, there is still room for improvement before this document is finalized. The discussion of Healthy Soils focuses almost exclusively on carbon storage potential and does not mention on-farm management opportunities that can reduce emissions of other potent greenhouse gases like nitrous oxide and methane. And although the complementary Scoping Plan document released last year validates the importance of low-input, biologically-diverse and organic farming systems for reducing emissions, they are not mentioned in the draft Investment Plan. The discussion of agricultural lands conservation is likewise lacking. ARB has rightly recognized that protecting our natural and working lands can increase opportunities for carbon sequestration, but does not adequately credit the significant avoided emissions from preventing the conversion of agricultural lands to more carbon-intensive urban uses. Making this crucial linkage has been a main focus of our efforts in advocating for the Sustainable Agricultural Lands Conservation (SALC) Program. Finally, ARB runs the risk of promoting a too-narrow set of strategies to reduce dairy methane emissions, which have been identified as a primary target in the state’s proposed Short-Lived Climate Pollutants Strategy. As we note in a separate set of comments [click to view], submitted today, California’s diverse dairy industry requires a diverse set of methane reduction strategies, including dry manure management methods, pasture-based practices, and composting. 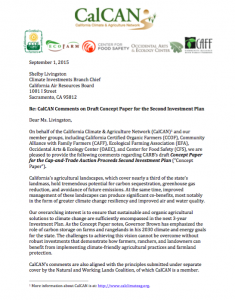 The encouraging aspects of ARB’s draft Investment Plan result from years of advocacy on the part of CalCAN and many other organizations, researchers, and individuals. We were pleased to submit a separate set of comments [click to view] alongside our partners in the Natural and Working Lands Coalition, who have championed our calls for improved investment in agricultural land conservation and broadened the reach of our message. In many ways, the Investment Plan document shows potential to put California on the right track for making climate investments that take a long-term view, produce multiple benefits to our environment and communities, and encourage a healthier and more sustainable agriculture in the state. Once the Investment Plan is finalized, much more work will still be needed to make sure we see transformative actions take shape on the ground.